Shooting food plates can be a straight forward procedure for some, or become a quite complex task depending on what you want to accomplish. 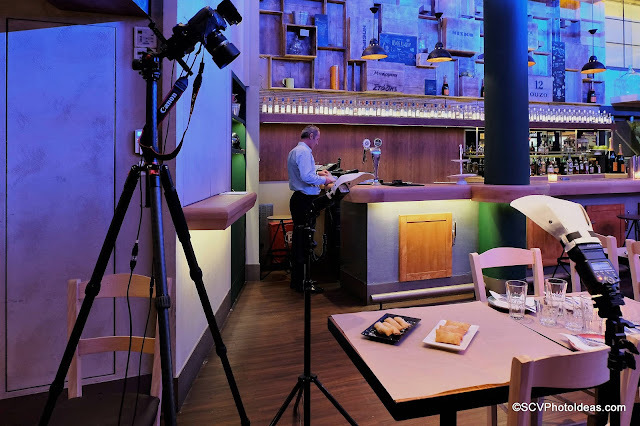 Nowadays, everyone or almost everyone (as I'm not included) is with a smartphone in hand shooting food in restaurants transferring the image on social media. On the other hand when a restaurant wants to promote their dishes, chooses more sophisticated methods. In this case the goal was to maintain the atmosphere of the place in the presentation of the dishes, avoiding harsh contrast backgrounds. These are not gourmet dishes but not tavern plates either. This in between feeling was the most difficult part considering the color reflected from the hall. More than this, each dish had to be as close as to what the customer will see when actually served in contrast to most dishes photographed in a studio with plastic food. Numerous tests were required, with different lighting approaches, in order to succeed a balance between desired and undesired reflections while keeping shades mild. Some of the juicy models that have an active role in the menu are illustrated below for your taste! Classic Greek salad dish with some innovative accents. Chef's salad with soft cheese and own sauce recipe. Big juicy grilled steak served with spicy and soft sauces. Large pork chop with grilled veggies. Pork spare ribs dipped in barbecue sauce. Juicy grilled chicken filet with veggies. Spicy sausage and tasty cheese combination rolled in home made pastry. More spice and flavor with white cheese folded in home made pastry. And finally some dessert. Baklava is home made pastry with nuts and sweet syrup fried in olive oil, while Halvah made of sesame, sugar and honey. As mentioned in the beginning various lighting solutions from various angles were tested, including soft-boxes, direct flash, bounced flash, starting from 4 flash units and decreasing finally to 2. A solid Desmond DCF-432 Carbon Fiber Tripod, a prototype Sunwayfoto GH-Pro geared head, Sunwayfoto MFR-150S focusing rail, Canon EOS 7D with tack sharp EF-S 60 mm f/2.8 macro USM lens, finally two Canon Speedlites a 580EX II and a 430EX II with Flash Bounce diffusers. If by the way, the photos succeeded to open your appetite, then I have had a successful session. No other photo manipulation than minor light balancing and color saturation.